Over the past few years there has been a lot of advances in smart manufacturing, smart cities and automotive all becoming more connected as we move further into the digital age. 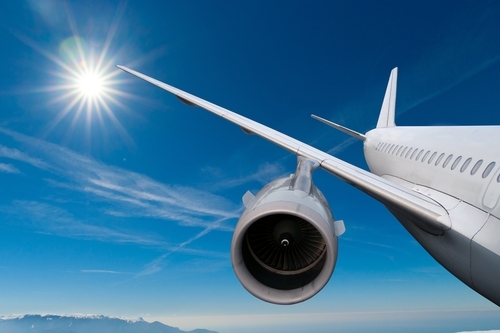 Aerospace can now be added to that list with airlines investing in connected hardware and services technologies. According to the Honeywell Connected Aircraft Report, the aviation industry will be investing heavily in connected technology over the next few years, in order to reap the cost and efficiency benefits from sensing, collecting and analyzing real-time data collected by numerous sensors. The report also found that the main challenge faced by the industry was maintenance where problems frequently cause costly delays and downtime. By embracing connected technologies, the aviation industry will benefit from predictive maintenance, enabling them to use real-time data to improve passenger experience and become more cost efficient. Predictive maintenance utilizes historical and real-time data and analysis to predict when failure might happen rather than wait until something goes wrong. It is proactive rather than reactive so repairs can be made before problems arise. 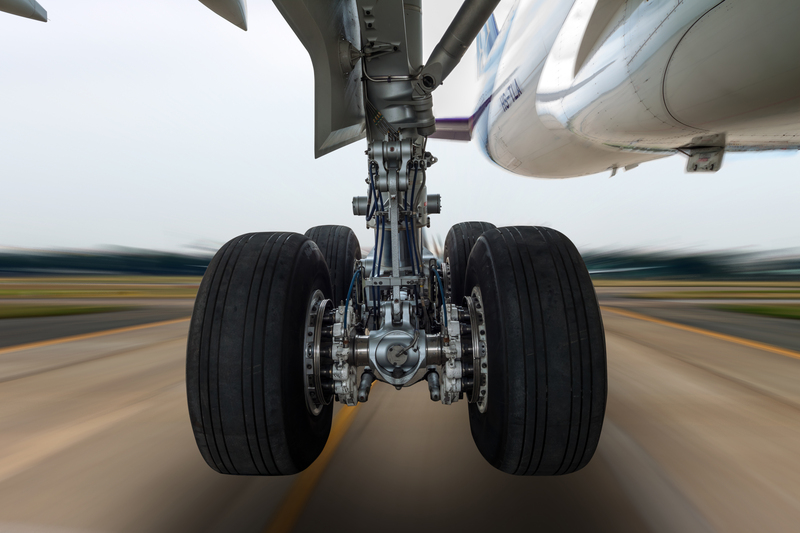 In order to access the data, smart sensors need to be strategically placed on equipment and machinery – the engine, wings, landing gear for example. This data is then analysed to check the systems are working correctly and highlight any potential failures and maintenance issues. Used correctly, this data will enable airlines to carry out predictive maintenance by repairing any potential issues before they happen, schedule servicing and highlight any trends that may cause future issues. Performing repairs and maintenance at the right time will not only save the aviation industry billions of dollars but also improve customer satisfaction levels by reducing delays and downtime. However, for all the opportunities, aviation has its own challenges when taking on connected technologies and these need to be overcome to gain the full benefits. Airlines can only use the data provided by the smart sensors if the sensors themselves are working effectively. They need to be powered efficiently and cost effectively without causing problems for the aircraft. The dramatic increase in sensors cannot result in a dramatic increase in cabling linked to the power source. It would not only add far too much weight to the aircraft but some sensors will be in places that are difficult to access with cabling. As a result, there is a trend to move towards battery power in order to remove the need for heavy cabling whilst keeping the sensors powered to do their job effectively. If the devices that are supposed to predict failure go down themselves there is no benefit in having them. A smart, connected industry soon becomes “unsmart” when the sensors collecting the data fail themselves due to lack of battery power. Traditionally, battery technology included polymer or liquid electrolytes could not work under the high temperatures and vibrations common in the aviation industry, resulting in potentially dangerous leakages. Batteries capable of operating at higher temperatures, were often too large and cumbersome to be used in small, hard to reach locations, a problem worsened by the fact that they weren’t rechargeable. In addition to labor costs and safety issues in changing the batteries, there was also a negative environmental impact from constantly disposing of batteries once their power had been depleted. At Ilika we have been making advances in solid state battery technology to address the power needs of emergent technologies. These solid state batteries do not have the traditional polymer or liquid electrolytes, instead they use solid components with greater tolerance to high temperatures. The Stereax® P180 supports temperatures as high as +150°C and as low as -40°C. The ability to support these temperatures, in conjunction with their lack of liquid and polymer electrolytes, makes them leakage-free, thus improving safety issues. 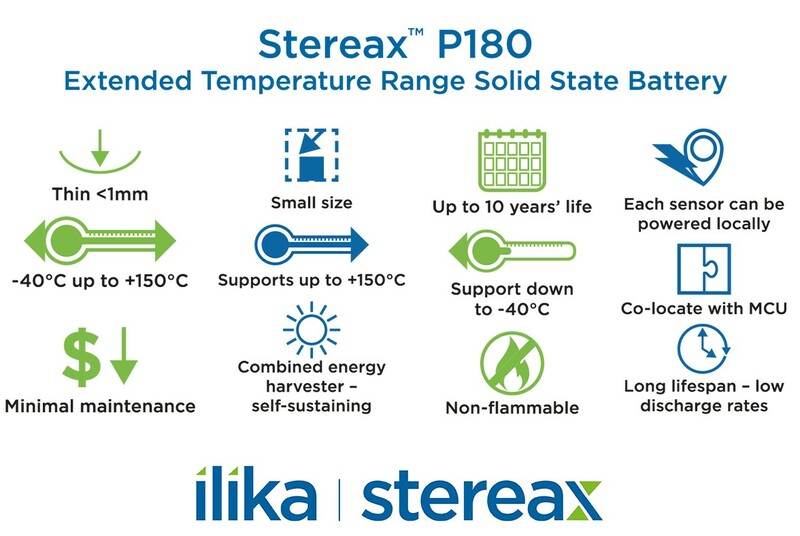 Airlines can install Stereax P180 batteries onto their equipment and machinery knowing they can safely tolerate the high temperatures found in the aviation industry. 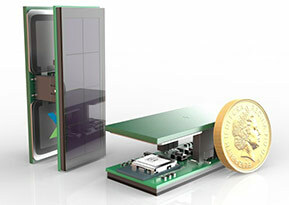 The long battery life offers huge cost savings as, what could be thousands of sensors, can be powered in a ‘Fit and Forget’ model. The need to frequently replace or recharge the batteries is removed, resulting in savings in labor costs and lower safety issues when changing them in hostile locations. Once the aviation industry has implemented a connected technologies strategy using solid state batteries to power the IoT devices, they can then can fully embrace their predictive maintenance programme. Moving from a reactive to a proactive maintenance plan using IoT will reduce downtime, cut costs and expensive delays, all which not only benefit the aviation industry but in turn improves customer satisfaction.